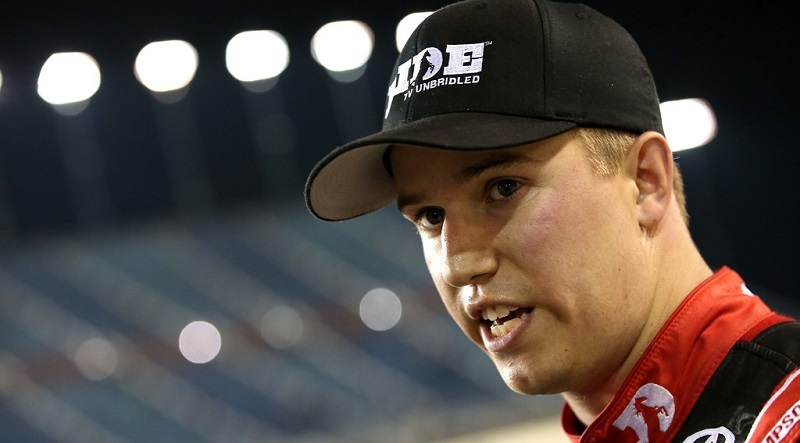 LAS VEGAS, NV — (November 13, 2018) — Getty Images/NASCAR Photo –Canadian stock car racer Cameron Hayley hasn’t raced in a couple of seasons due to starting a family and taking a more active role in the family business. Those things haven’t quelled the former NASCAR Camping World Truck Series racer’s need for speed, however, and Hayley is excited to team with Jefferson Pitts Racing to enter this weekend’s $10,000 to Win SRL Southwest Tour West Coast Short Track Championships at Las Vegas Motor Speedway ‘Bullring’ in Nevada, marking his return to racing. The relationship between Jefferson and Hayley actually started back several years when the young racer was driving for Gene Price Motorsports in the NASCAR K & N Pro Series West before moving up the ladder toward the NASCAR Camping World Truck Series. Hayley ran 49 races in the Truck Series, beginning with owner Steve Turner in 2014 and then two full seasons in 2015 and 2016 with Thorsport Racing. He accumulated 10 top five and 26 top ten finishes over the three-year period. He has kept his skills sharp by spending some time lapping at the Spring Mountain Motorsports Resort outside of Las Vegas running on their road course. Jefferson Pitts Racing (JPR) was formed in early 2015 after owners Jeff Jefferson and Jerry Pitts purchased assets from Gene Price Motorsports, where they combined for four series championships as crew chiefs. JPR has operated two full-time teams in the NASCAR K & N Pro Series West since their formation and has had tremendous success with drivers including Noah Gragson and Will Rodgers, who have built upon what they’ve learned in their climb up the motorsports ladder into a national series competition. The race takes place this Saturday, November 17th, at The Bullring at Las Vegas Motor Speedway and will be broadcast live on Lucas Oil Racing TV and shown tape delayed on MAVTV Motorsports Network at a date still to be determined. Great news, looking forward to following Cameron’s quest!